John B. Harris was born in Ridgeway January 6, 1908. He attended Marrowbone Elementary School, and the Martinsville Colored Grade School. He graduated from the Piedmont Christian Institute and Virginia State College. He did post graduate work at Patrick Henry Community College and at the University of Virginia. He retired from the Henry County schools after 38 years of service; however, he never retired from being an educator. After his retirement from education, he took on the role of historian. He continued to educate the community by sharing his research and his love of local history and genealogy. This African-American research is most valuable not only to our area, but to African-Americans from across the country. His collection, given to the Bassett Historical Center by his family, is used and appreciated, as it is the only one of this nature in the immediate area. His card files measure 8 linear feet, and his obituaries span the years 1956 to 1996 when he then became too ill to continue his research. Also included in his collection are family charts, loose papers, newspaper clippings and family files. His work was used in publishing the booklet entitled "Proud Heritage of Black Educators: Resource Guide" for the Martinsville-Henry County Chamber of Commerce in 2003. From the 1960s until the mid 1990s, Mr. Harris spent many hours at the Bassett Public Library in the genealogy area, researching Black History of the area, patiently searching through microfilm and records of Henry County. He continued to research at the now Bassett Historical Center, and would spend several days a week researching at the Center. Mr. Harris was a member of Oak Hill Baptist Cathedral of Glory and was very active in his church. He served in several capacities including church clerk, Chairman of the Deacon Board, as Sunday School Superintendent and, again, as a teacher. The Bassett Historical Center is extremely proud to have been given the Harris Collection. Mr. Harris abstracted the "Henry County Cohabitation List" , one of the few cohabitation lists left in the state of Virginia. He also abstracted the "1880 Census for Henry County, Virginia" (2 volumes) and these books are available for the public at the Center. Mr. Harris, along with Beverly Millner, also compiled "African-American Census 1870-1910 of Henry County, Virginia" (2 volumes) and "African-American Marriages of Henry County, Virginia". These books, along with two family compilations, are quite valuable to researchers. 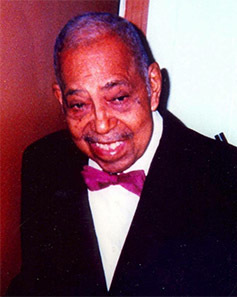 John Bruce Harris, Sr. died January 28, 1999 and we miss him still, his knowledge, his quiet manner, his friendship. We are enriched by having known him and by being able to still learn from this educator and historian through his works.